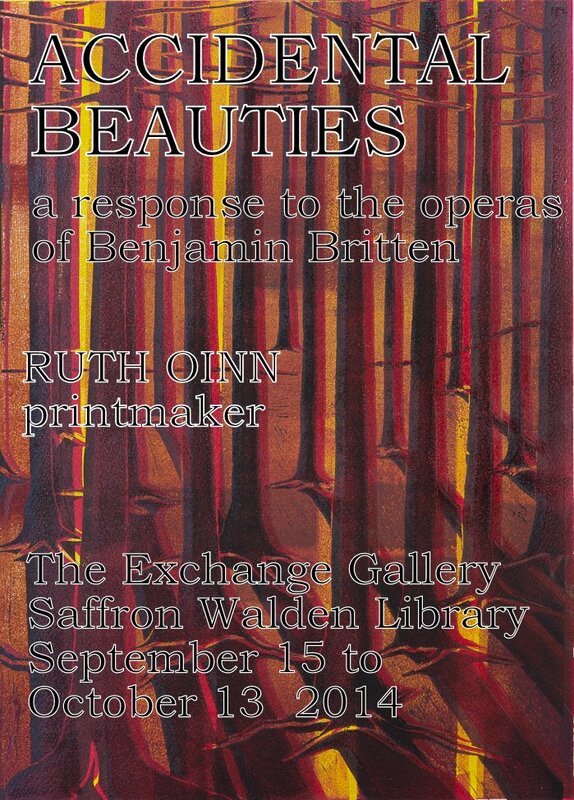 Accidental Beauties is an exhibition of a selection of the Hours of Healing prints, in Saffron Walden from mid September to mid October 2014. I am delighted to exhibit my work in my home town and I value the responses of friends and acquaintances to my work. The title of this exhibition comes from Paul Bunyan’s words to the lumberjacks at the opening of the second act of the opera Paul Bunyan. I have quoted the whole passage below. The words are by W H Auden. The songs of dawn have been sung and the night watchmen are already in the deep beginnings of sleep. Leaning upon their implements the hired men pause to consider their life by the light of mid – morning, and of habits already established in their loosened limbs. And the aggressive will is no longer pure. Much has been done to prepare a continent for the rejoicings and recriminations of all its possible heirs. Much has been ill done. There is never enough time to do more than one thing at a time, and there is always either too much of one thing or too little. Virtuosos of the axe, dynamiters and huntsmen, there has been an excess of military qualities, of the resourcefulness of thieves, the camaraderie of the irresponsible, and the accidental beauties of silly songs. Nevertheless you have done much to render yourselves unnecessary. Loneliness has worn lines of communication. Irrational destruction has made possible the establishment of a civilised order. Drunkenness and lechery have prepared the way for a routine of temperance and marriage. Already you have provoked a general impulse towards settlements and cultivation.